The GVAs of the Philippines’ real estate and construction sectors grew steadily between 2013 and 2017, reaching PHP 1,941bn for Construction and PHP 2,085bn for Real Estate and Other Business Activities in the latter year. The good performance of these sectors was mostly the result of healthy domestic demand for residential and office space, alongside government-backed infrastructure development programmes. A combination of relatively low property prices and growing incomes, parallel to urbanisation and a rise in modern lifestyles centred on nuclear families, has driven demand in the housing segment. The office segment has been pushed forward by the rapid development of IT-BPO* activities in the country, and by booming tourism, which needs more shopping malls, gaming centres, and entertainment facilities to maintain its positive trajectory. IT-BPO and tourism are expected to be the major drivers of real estate growth for the foreseeable future. 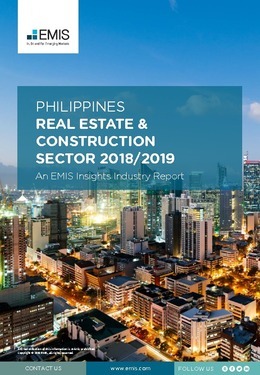 This report provides a complete and detailed analysis of the construction and real estate sector for the Philippines. EMIS Insights presents in-depth business intelligence in a standard format across countries and regions, providing a balanced mix between analysis and data.